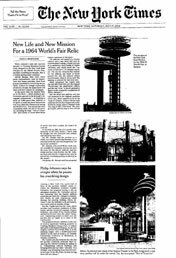 Philip Johnson's steel and concrete fantasia in Flushing Meadows-Corona Park, designed as the New York State Pavilion for the 1964-65 World's Fair has been crumbling for decades. Now it is finally getting some attention. Mr. Johnson who turned 98 last week was unavailable for comment but Alan Ritchie [Philip Johnson's design partner] said "Mr. Johnson cringed every time he passed the crumbling pavilion on the way to the airport." Manhattan Architect Frankie Campione has proposed turning the pavilion into an aerospace museum. Mr. Campione said he was concerned that the [pending] theater addition would detract from Mr. Johnson's composition. Worse, he said, construction could damage the existing building, which, because it was not intended to be permanent, was constructed on wooden pilings. The [pavilion] is only one of several significant building projects in Flushing Meadow Corona Park. A radical alteration to the Queens Museum, by the Los Angeles architect Eric Owen Moss is in the panning stages and a 55,000 sf addition to the Hall of Science by Polshek Partnership Architects of Manhattan is nearing completion.